It was a perfect way to start this otherwise gloomy Monday! Deepika Padukone introduction of 'Malti' from Chhapaak is something that we were eagerly waiting for. The movie revolves around the life of acid attack survivor, Laxmi Aggarwal and DP plays the lead in it. Helmed by Raazi director, Meghna Gulzar, Chhapaak also stars Vikrant Massey in a pivotal role. While we were simply awestruck to see her first look from her next, Twitterati too is going gaga over the same. She's a replica of Laxmi and hats off to the makers for making the impossible look possible. Chhapaak First Look Out! Deepika Padukone's'Malti' Will Give You Another Reason to Adore and Respect Her - View Pic. From hailing this queen of Bollywood to appreciating her brave efforts and the striking similarities between Laxmi and her, Twitter is currently flooded with all the good messages for Deepika. She's all set for another victory and we can't wait for it to hit the screens in January next year. While the wait is long enough, let's quickly go through some twitter reactions for her first look that will make you a bit more eager beaver. 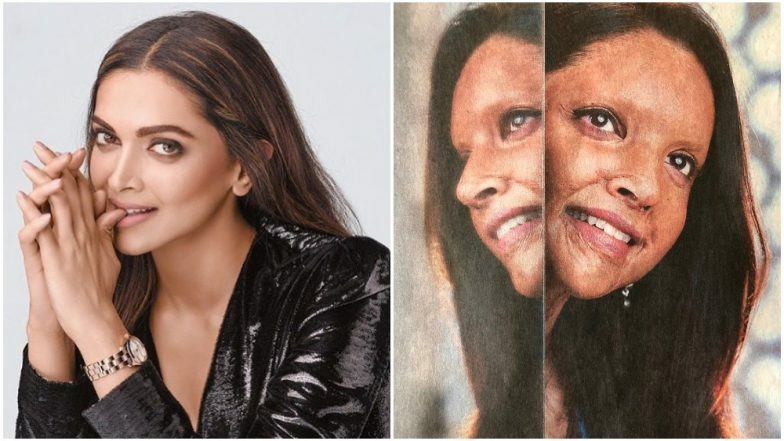 Deepika Padukone to Meet Acid Attack Survivor Laxmi Agarwal Before Chhapaak Goes On Floors. We are proud of her too! Wow! Thank you for playing this character and telling this courageous story🤗🤗🤗 you are too brave @deepikapadukone. Deepika Padukone's Chhapaak is all set to clash with Ajay Devgn's Tanhaji on January 10, 2020. The movie goes on floors today in Delhi and it will be a month-long schedule for the team.